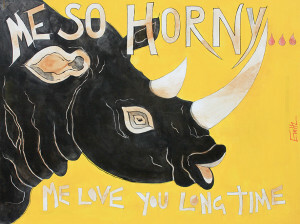 Eva’s painting Yellow Horny is also available as Limited Editions of 100 on Permajet Omega rag 310 gsm paper. The edition consists of 50 copies at (printed)size A1, 25 copies at size A0 and 25 copies available in different sizes to request. Size of the original painting, acrylic on canvas, is 122 x 91 cm, please view under the Representational Paintings tab.